Six years ago I ran across the correspondence of a clothing sales representative, most of which was rejection letters from firms with which he was seeking a position. I wrote about the letters at the time, but in looking through them recently I was really struck by several new thoughts. 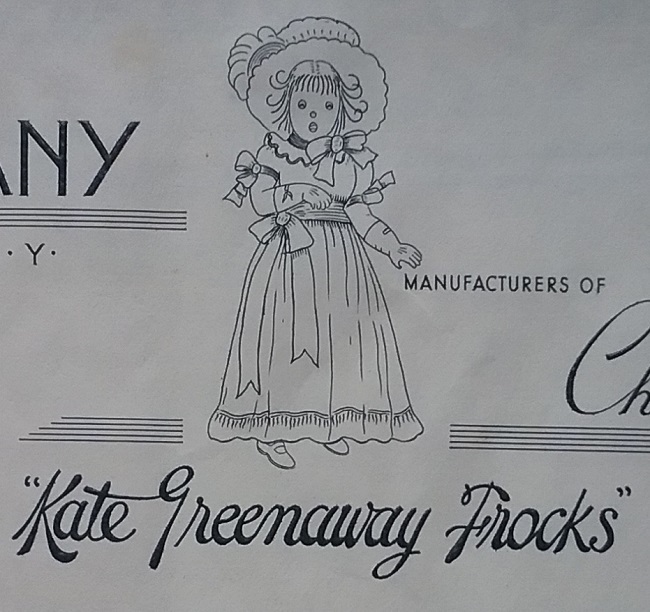 Many of the letterhead illustrations included facsimiles of the labels the companies used. 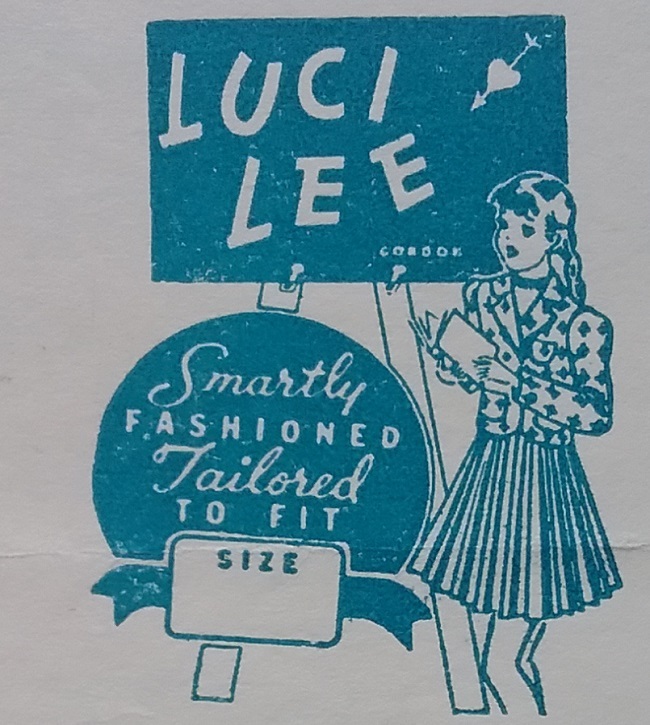 These could be useful not only in helping to date a garment, but also in identifying the maker of a certain label. 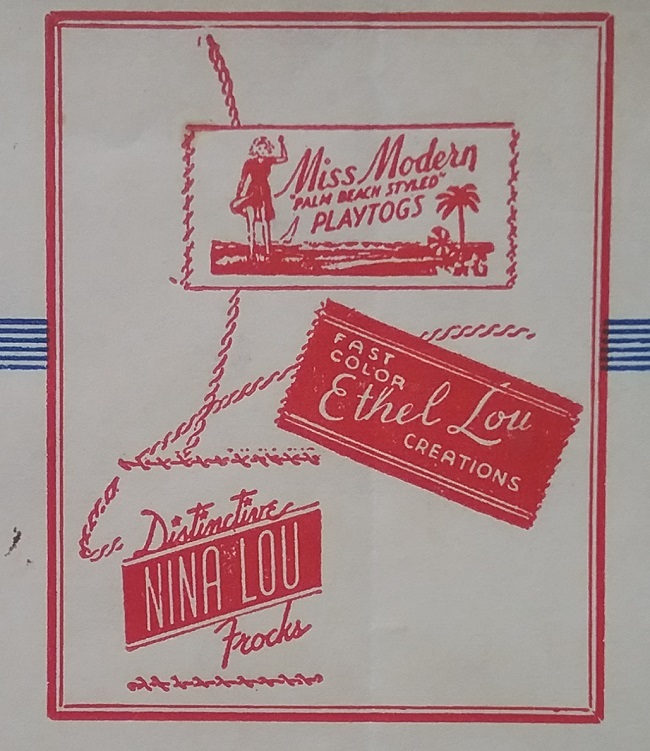 In the case above, Miss Modern Playtogs, Ethel Lou Creations, and Nina Lou Frocks were all made by the Alton Garment Company of St. Louis, a fact that would be lost if not for documentation such as the letters. Another important lesson from these letters is how widespread the manufacturing of clothing was in the United States. 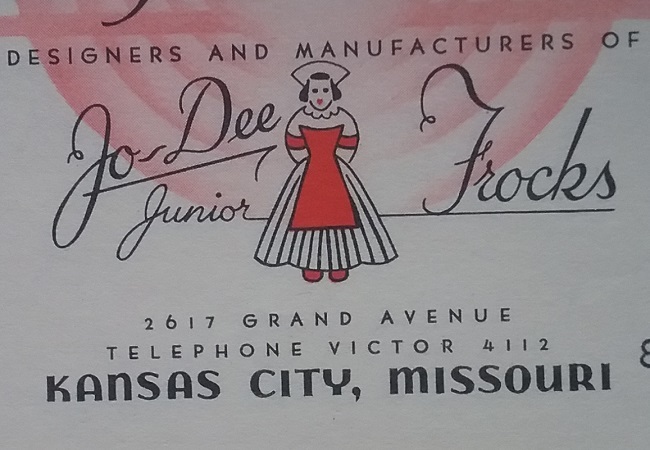 Fashion history tends to focus on New York (and no doubt, the fashion industry there was very important), with an occasional nod to the California and Florida sportswear makers, the junior dress industry of St. Louis, and the woolen manufacturers of the North and Northwest. 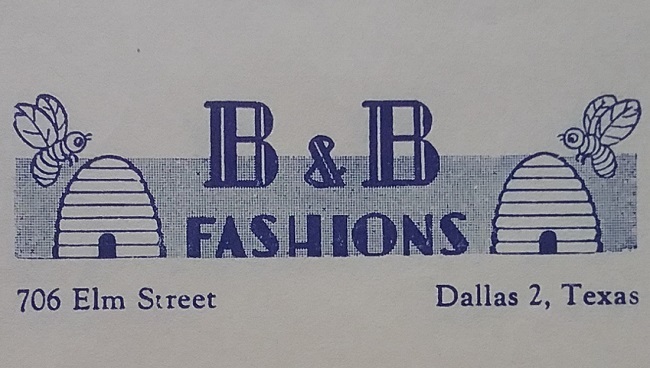 We are reminded that Dallas was another center for sportswear, and that Cleveland had a large knitwear industry. 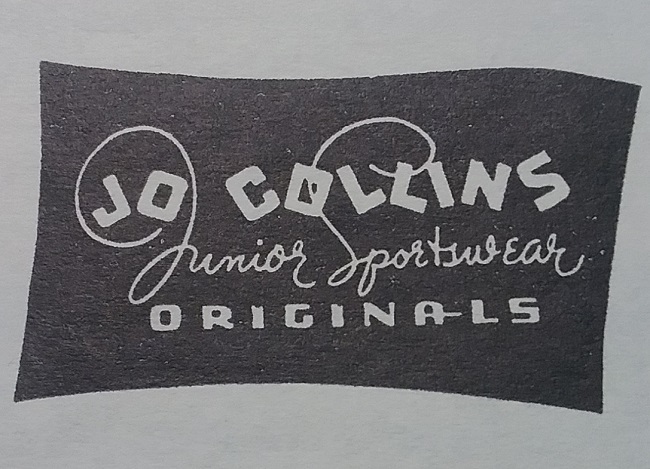 Not only was Saint Louis a center for junior wear, so was Kansas City. And I couldn’t help but notice how many different clothing manufacturing companies were located in Boston. while others were definitely looking toward the 1950s. 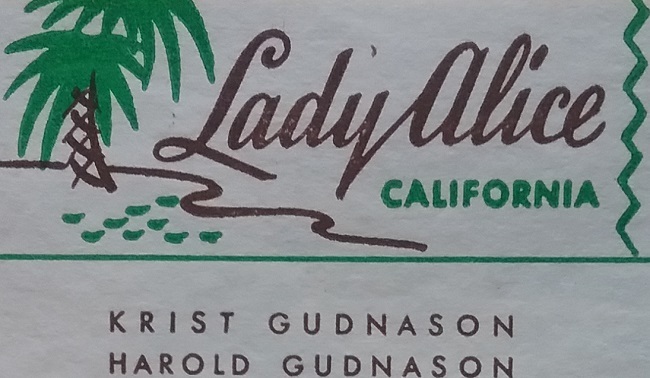 The California companies were more likely to use “California lifestyle” imagery in their logos. Companies that made clothing for children and teens were more likely to use images of dresses. Teen and junior lines were more likely to use quirky fonts and design. And whatever happened to the word frock? Lately I’ve been attracted to ads that are shaped like the objects they are promoting. I’m sure there is a name for this, but it escapes me at the moment. 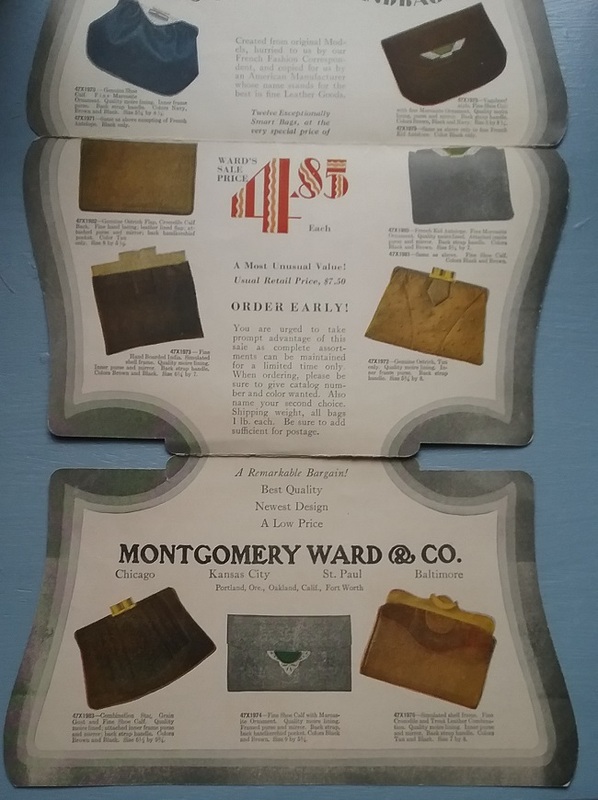 I recently found this example of a handbag sales folder from Montgomery Ward. The back of the folder even has the back strap handle printed onto the paper. 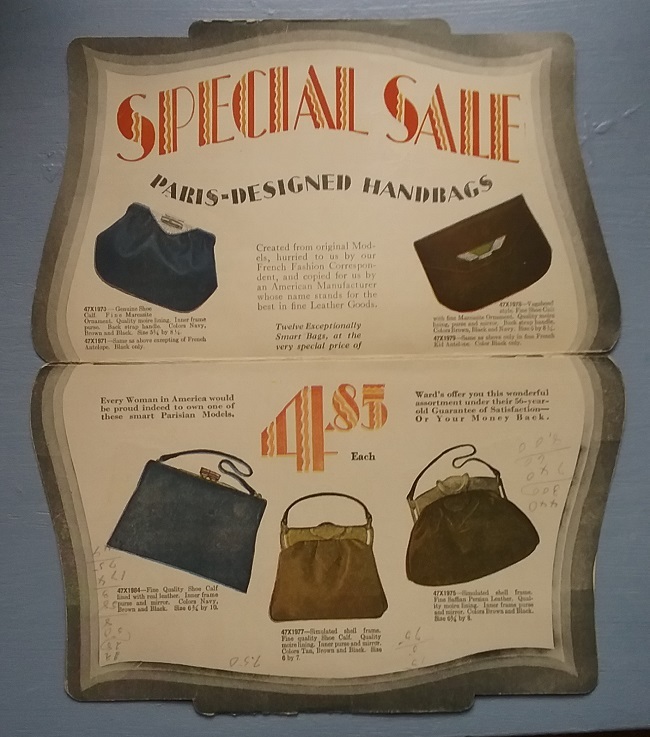 Open the “handbag” and you see the $4.85 Paris-designed handbags offered by Montgomery Ward. 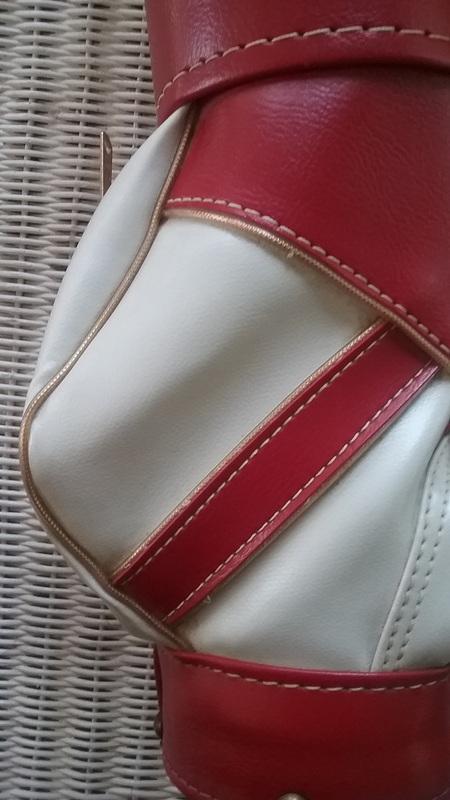 There is a variety of styles in various leathers, most being offered in more than one color. 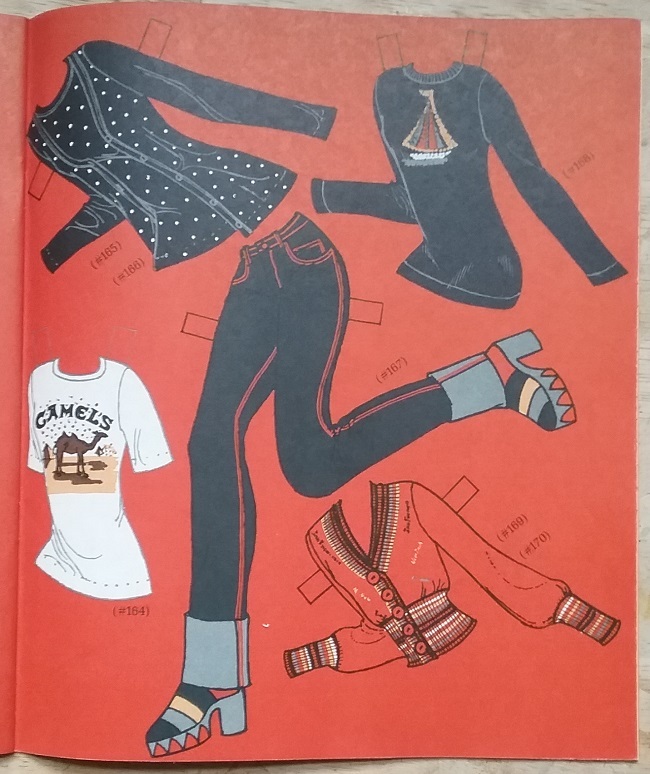 There were several designs in ostrich and French kid antelope. Some of the clasps have marcasite ornaments, and one has crocodile trim. The “shell frames” seen on two designs are simulated. In all, they look to be quality products. The $4.85 price looks to be a tremendous bargain, but the US Inflation Calculator tells me the cost in 2019 dollars would be $71.69. That is still a good price for a quality handbag. One thing my little paper handbags lacks is a date. From the styles I knew this dated to the second half of the 1920s, or maybe into the early 30s. But a close reading of the ad copy provided the exact answer. 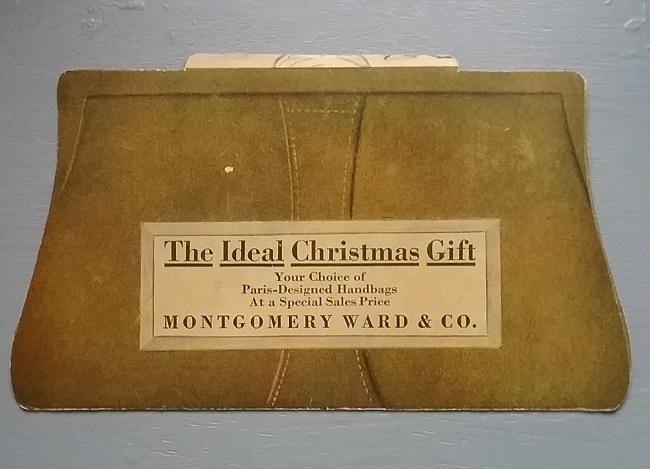 Montgomery Ward dated the beginning of the company to 1872, so add fifty-six years to that, and I determined that the brochure dates to 1928. 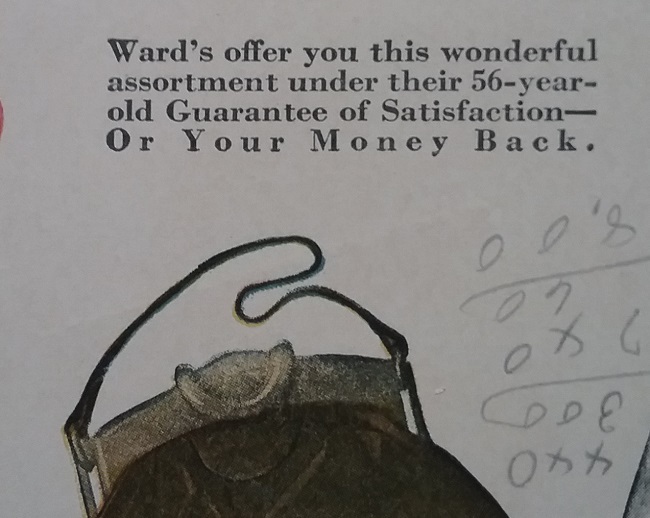 Another part of the ad copy reveals a bit of how the fashion industry operated at the time. Created from original Models, hurried to us by our French Fashion Correspondent, and copied for us by an American Manufacturer whose name stands for the best in fine Leather Goods. It seems like someone is always trying to sell us something. With the internet and companies tracking our every click, we are subjected to targeted ads everytime we open a digital device. Websites we visit are covered with display ads. There’s nothing subtle about it. Stores have always known that to sell a product, the consumer has to notice it. Store windows have been designed to draw people into stores, and once in the store, displays are set up to attract attention. 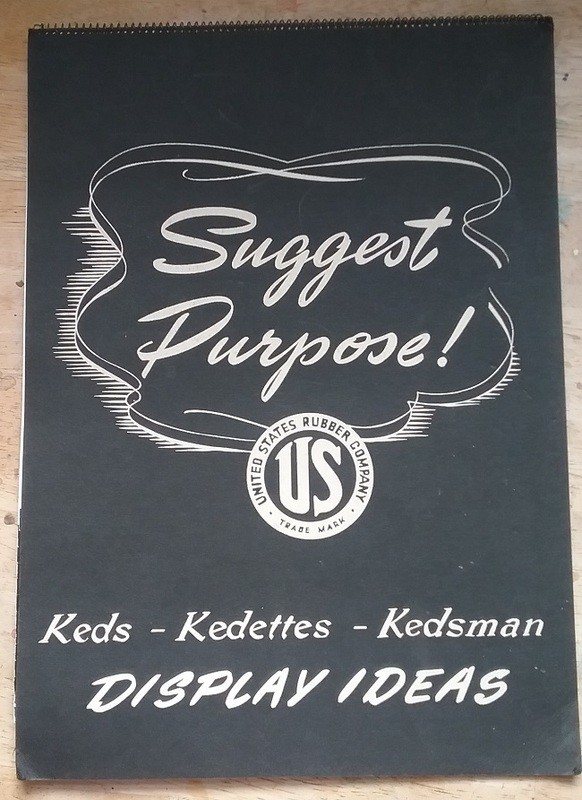 It’s true today, and it was true in 1940,when the footwear manager of sales at Keds sent out a portfolio of suggested ways to promote Keds in windows and in the stores that sold them. 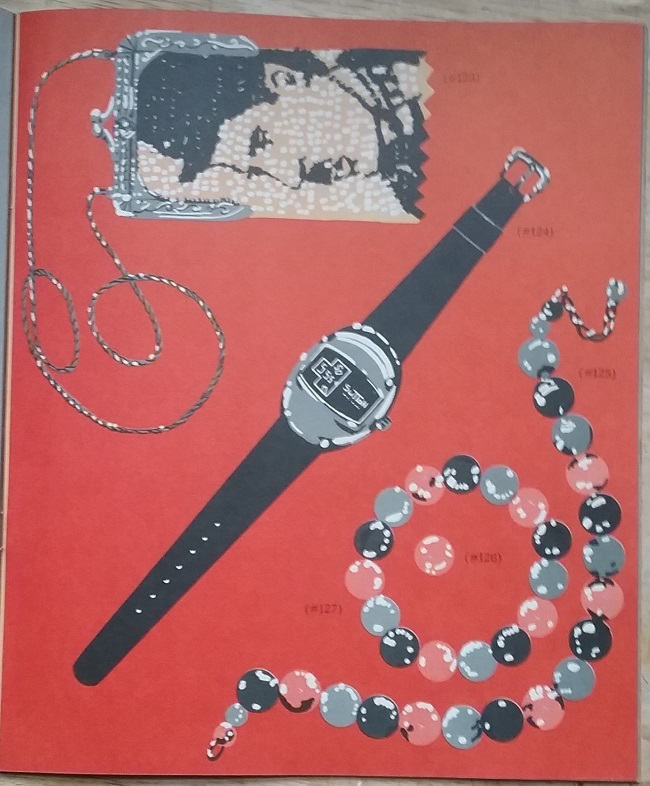 As you will see, there was a central theme that stores were being encouraged to emphasize. Can you spot what the theme is? All the displays were built around several counter display cards like the two seen above. 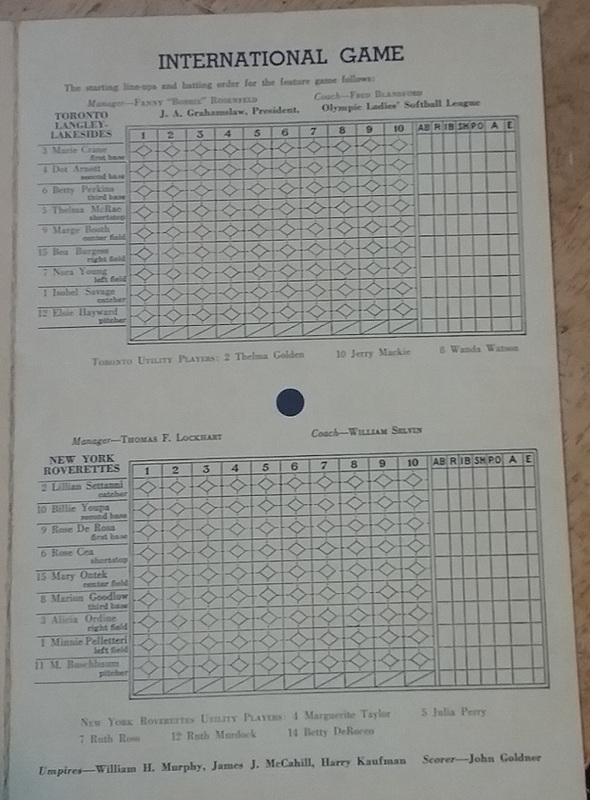 I’ll guess that the cards were a part of the display package that included my display booklet. The above display was titled Gardening and Leisure. 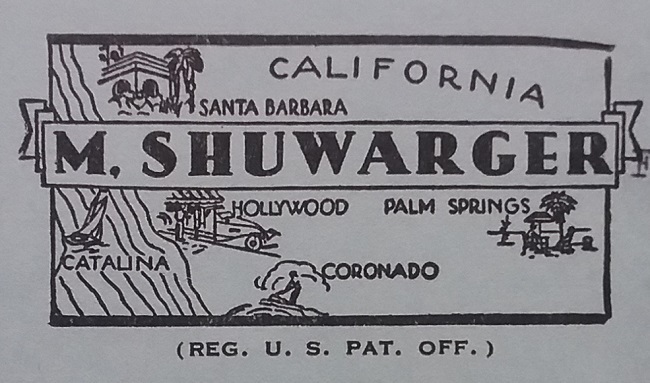 Vacation and Camp features a counter card with hikers. I wonder where they got that little tent. 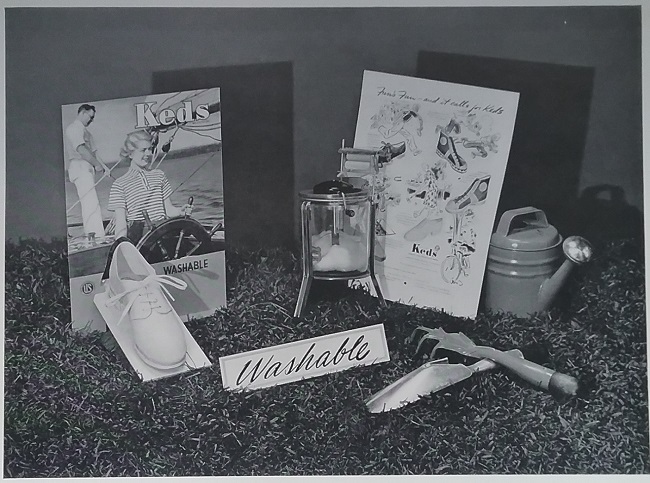 Keds are also great for leisure hours, but who in their right mind thought doing laundry in a wringer washer was part of leisure? It’s obvious that Mr. Adman never did a load of washing in one of those monsters. 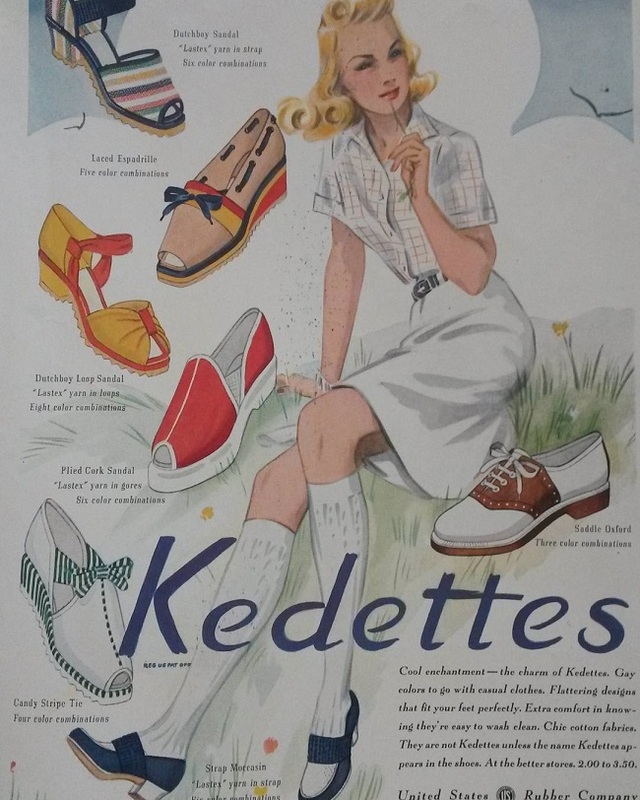 The booklet also had suggestions for the Kedettes line of shoes. 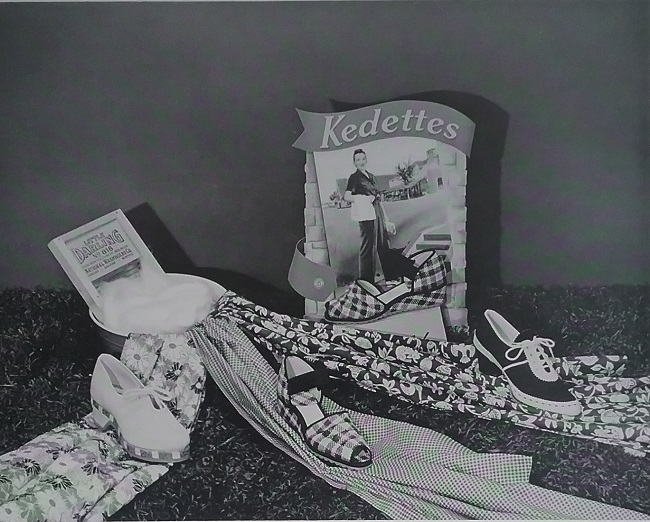 Kedettes was still made of canvas, but were a step dressier than sneakers. 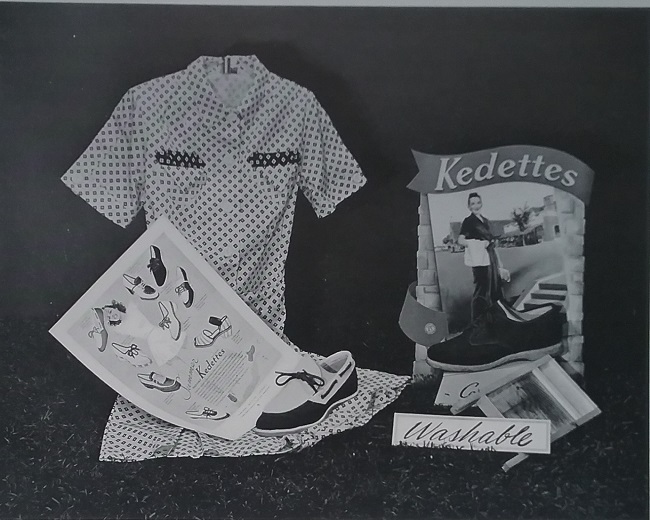 Here’s the consumer is reminded that Kedettes go well with one’s playtogs, like that playsuit. There was even a display suggestion for the piece goods department. I really wish these photo were in color. I’ve seen these shoes in vintage magazine ads and they are so bright and colorful. 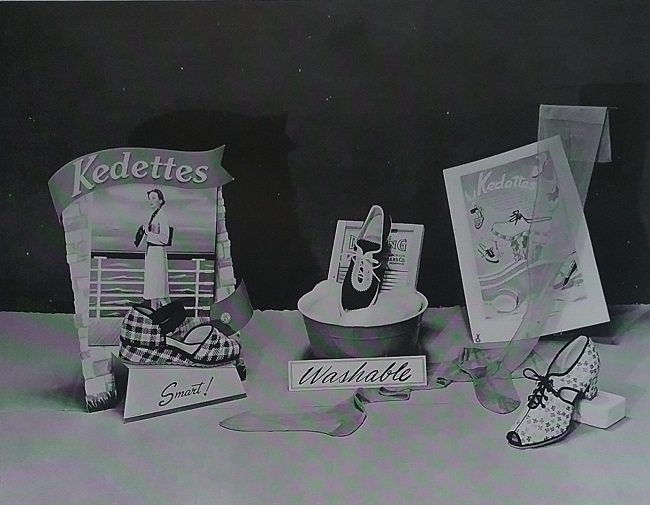 There were also suggestions on how to pair Kedettes with hosiery. 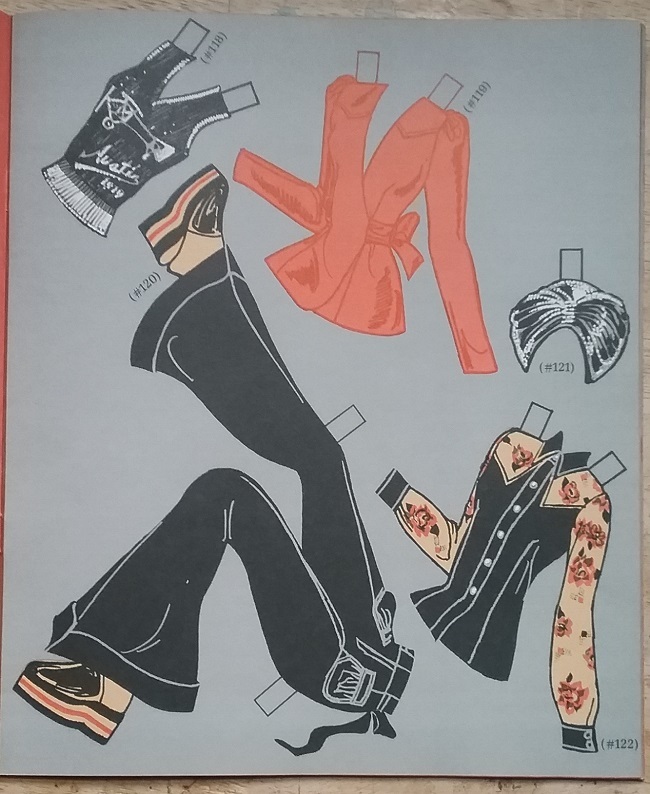 Somehow I can’t quite picture these comfortable shoes paired up with a girdle and stockings, but then I’m looking at this through modern eyes and a more casual mode of dress. 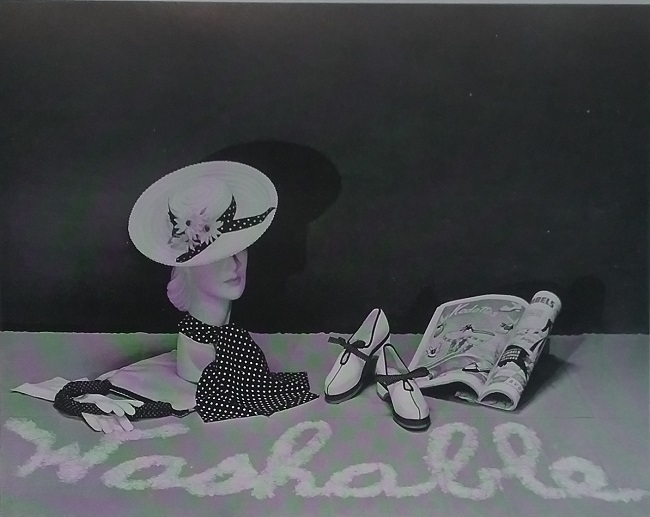 So, if you were so busy admiring the photos that you forgot to think about the common theme, it is washable, here spelled out in washing powder. So that explains the washing machine in the leisure display, and the tub of cotton suds and tiny washboard. 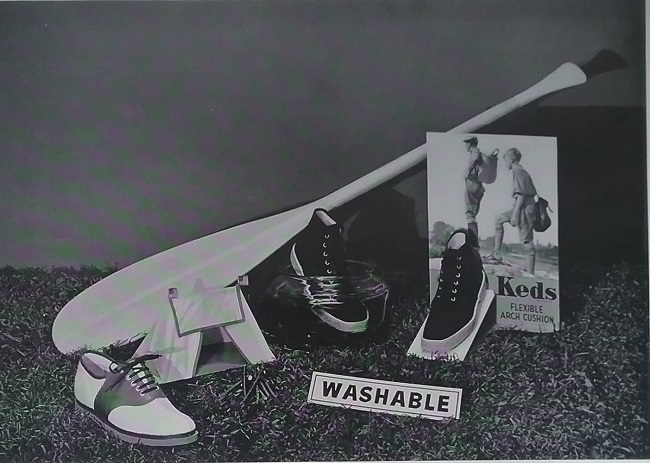 I can’t imagine putting these shoes in a washing machine, as was implied, as a gentle hand wash is all I’d dare expose my Kedettes to! 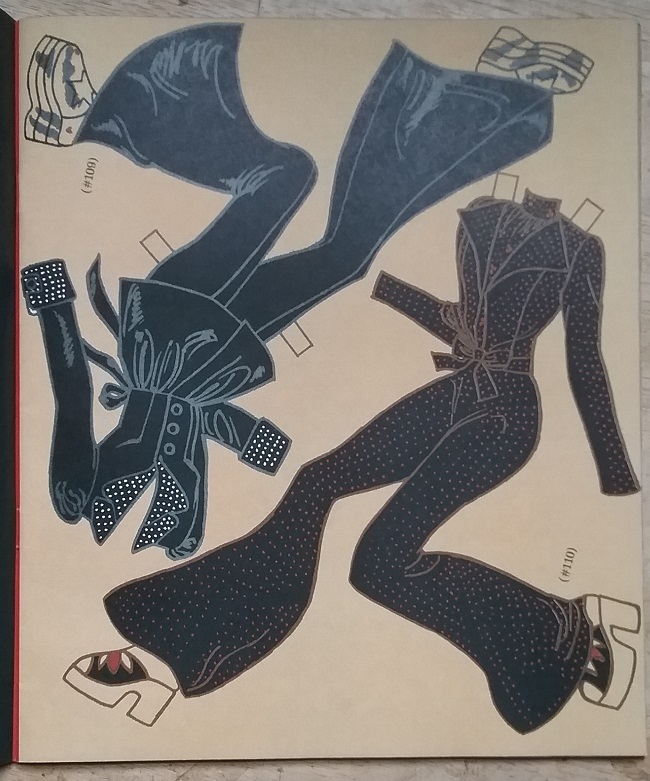 A lot of the fashion origin stories one encounters are not entirely true, but the one about pants for women being popularized during the World War Two years is pretty much accurate. 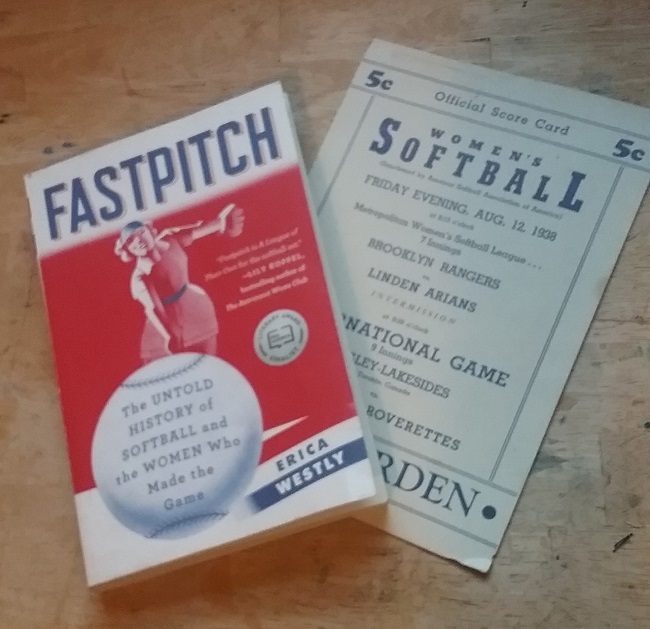 Many Western women had been wearing pants of some form since the middle of the nineteenth century, and as the 1940s approached, more women were wearing pants for sports, leisure, and work. But it wasn’t until war broke out that more and more women began wearing pants as they took over jobs traditionally allotted to men. 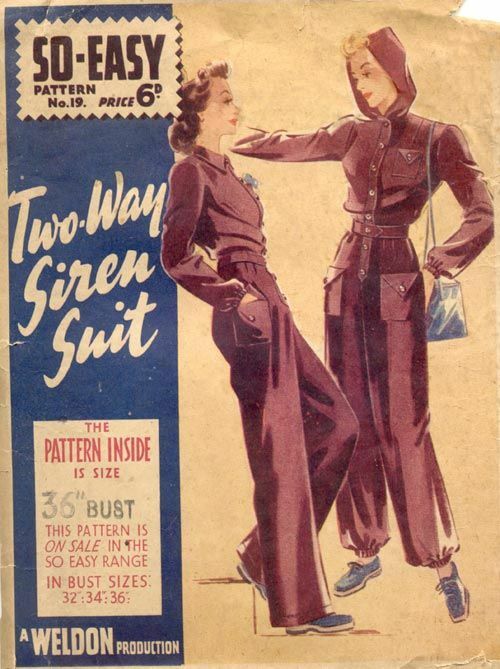 Women had been wearing pants as part of a pajama suit since at least the 1910s, but WWII brought a new nighttime pants suit to those in England and France – the siren suit. The siren suit was designed to go over one’s nightie in case the air raid sirens went off and it became necessary to head for the nearest shelter. The siren suit (I’ve also seen it referred to as a blitz suit) was designed for speed of dressing, comfort, and warmth. The style above shows buttons or snaps, but most examples I’ve seen in photos show the suit as having a long front zipper. Most styles have multiple pockets in which to stow essentials that may be needed during the time in shelter. Many also had hoods, and were made of warm fabrics. Which brings me to this garment, one of the newest additions to my collection. I recently was the high bidder on a few lots from an auction house that specializes in old clothes and textiles. I always enjoy this auction’s offerings, as they usually have nice sporting things. 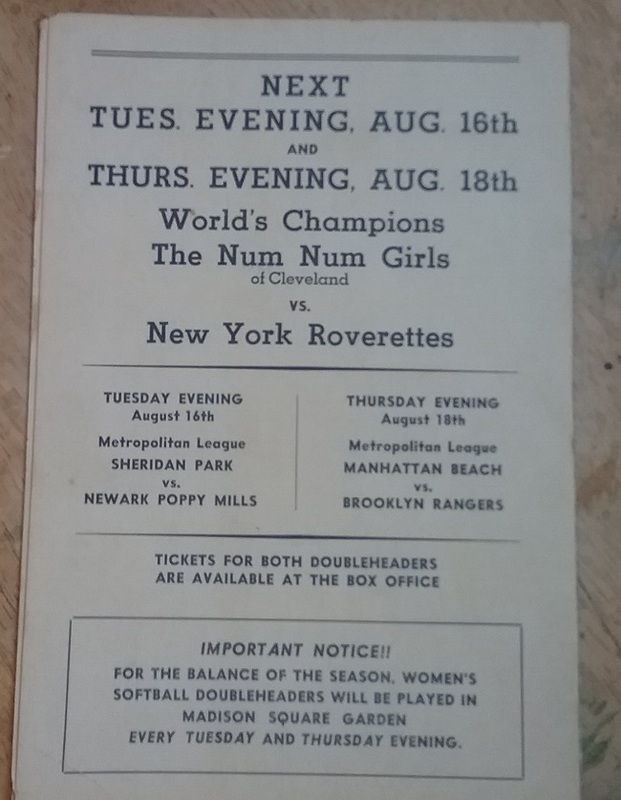 This last auction was no exception, so I sent in a few bids and crossed my fingers. 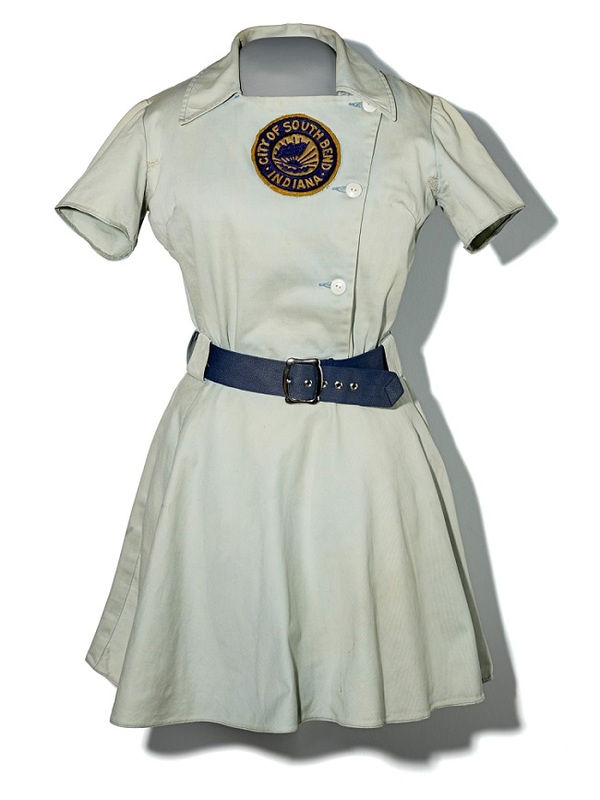 The jumpsuit was paired with a 1930s outdoors ensemble from the 1930s, consisting of pants, jacket, and matching hat. I wanted that set, and to be honest, didn’t pay a whole lot of attention to the jumpsuit. 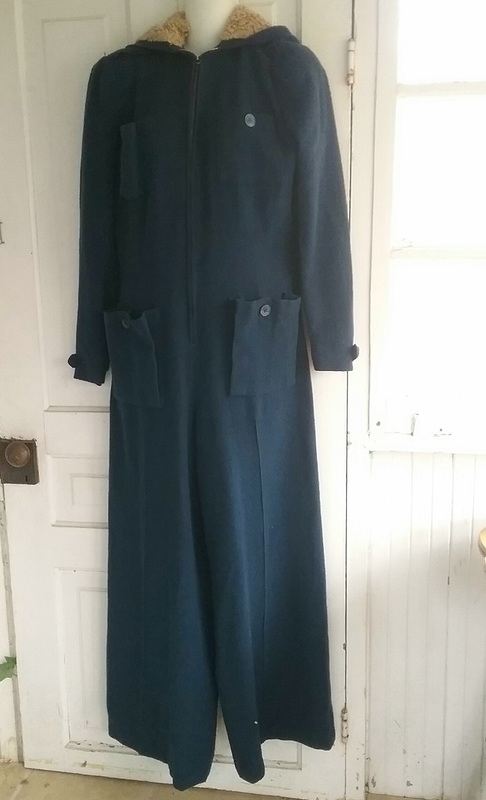 It was described as being a 1940s one-piece ski suit. When the package arrived, I acted like a kid on Christmas morning, and then got down to the work of examining each piece. When I picked up this one, I immediately got the feeling that this was no ski suit. Actually, I should have noticed this just from the photos, but like I said, I was distracted by the other piece. On reflection, I realized that I’d never seen a photo of a woman’s one-piece ski suit from the 1940s. That does not mean this type was not made, only that if they were, they had escaped my attention in the many hours I’ve spent looking in fashion magazines and catalogs. Then I started thinking about the legs of my new suit. A ski suit has to have leg hems that are narrow, to keep the snow out. These are anything but narrow. At this point I knew it was time to look at the details. 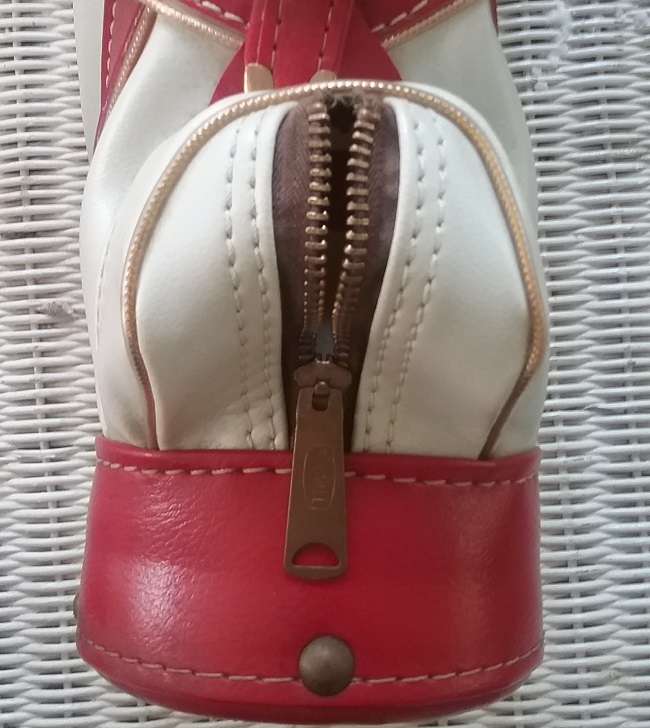 First up was the center front zipper. 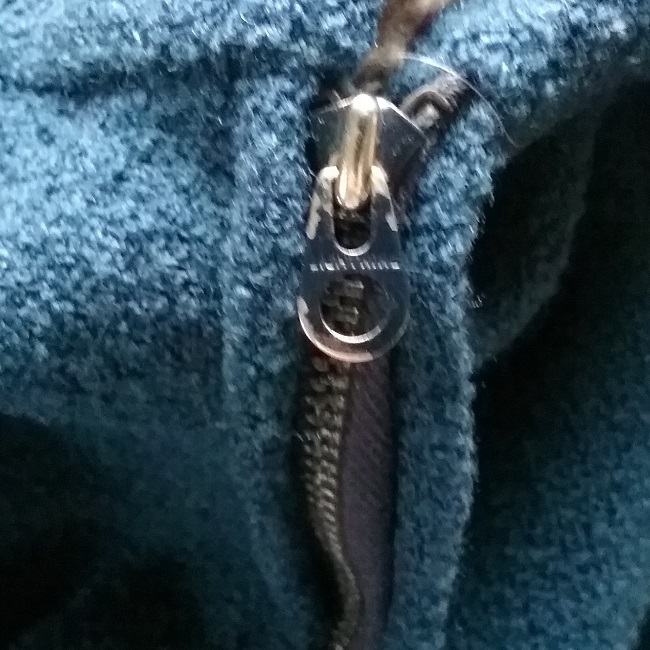 The pull had an odd shape (not too unusual for earlier zippers) and I got out my new magnifier to read the brand name stamped on it. The brand is Lightning. 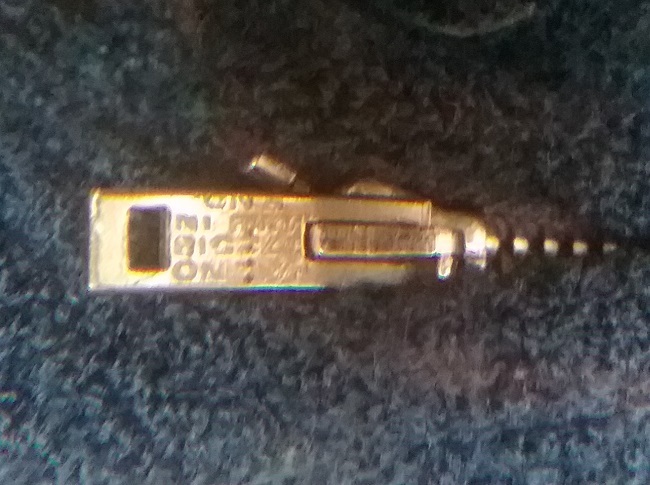 This was the first clue this item was not manufactured in the US, as Lightning zippers were made in England. There are also two zippers on the back, as this jumpsuit has a drop-flap to aid in the use of the toilet. My apologies about this photo as it is upside-down, but it has a very useful patent number and the words “Made in ENG”. Actually the patent number, 472518, has escaped me, and I’ve searched both US and UK patents. I put the patent search on hold and took another look at the interior of the garment. The edges were serged, or overlocked, but in a style of stitch with which I am unfamiliar. Again, this points to a foreign manufacture. I finally began to see the light. Big, functional pockets, a front zipper, wide legs, and a drop seat all told me this was not a ski suit. The fact that it was most probably made in England pointed to the siren suit, a garment you’d not expect to see in the US. As I stated, I’ve never seen a one piece ski suit for adults of this era. Women were wearing jumpsuits and overalls for work, and these, while not terribly common, are found in the US fairly easily. But they are made from cotton or lightweight gabardine of wool, sometimes with cotton mixed in. This is a nice, textured wool and is quite hefty. The drop seat also makes no sense in a ski suit. After skiing where you get wet (and this fabric would really make the snow cling) and cold, and you would change into something dry as soon as possible. A former owner had sewn the flap shut. I can see why, especially if it has been worn in recent years as a jumpsuit. 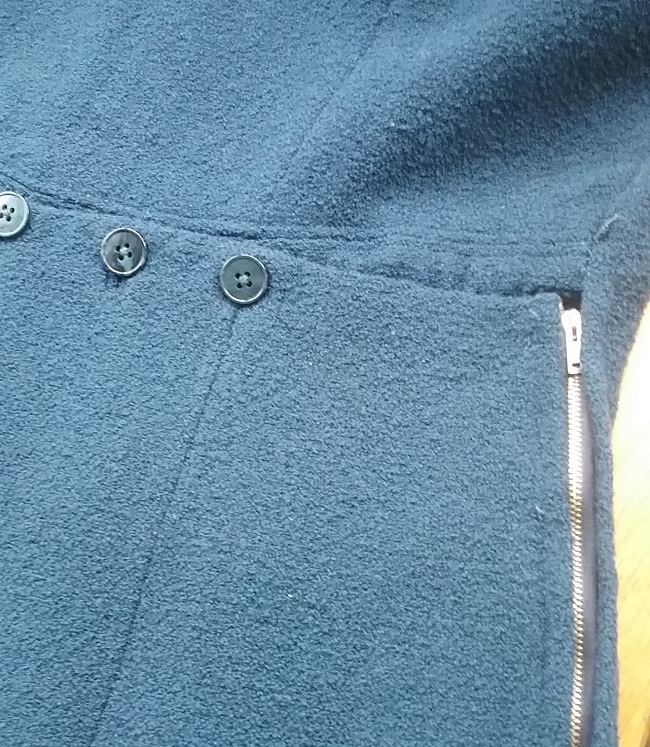 There is a bit of a gap between zipper and buttons. 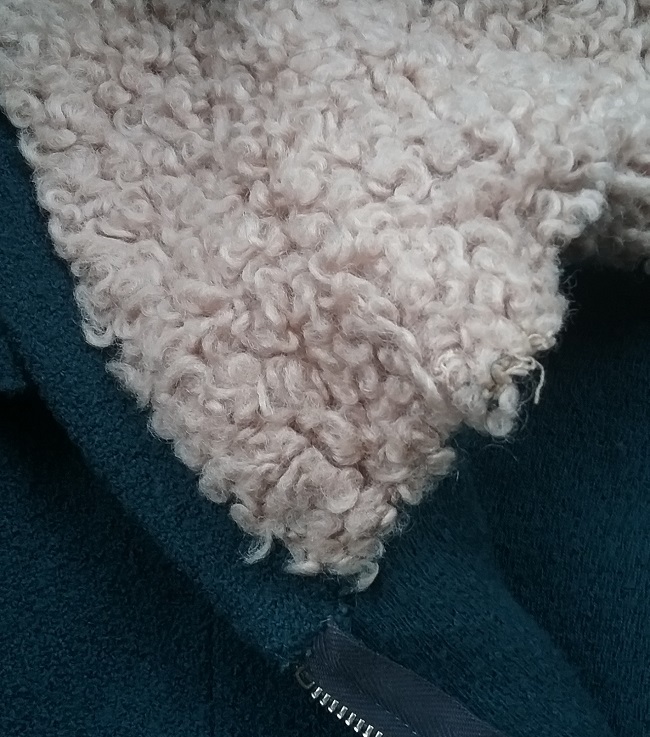 There is also a bit of a belt loop that was hidden under the stitches. I’m assuming there was a matching belt. And speaking of buttons – these are not the originals. They are modern replacements, and while they match nicely, the buttons on the flap are too large for the holes. 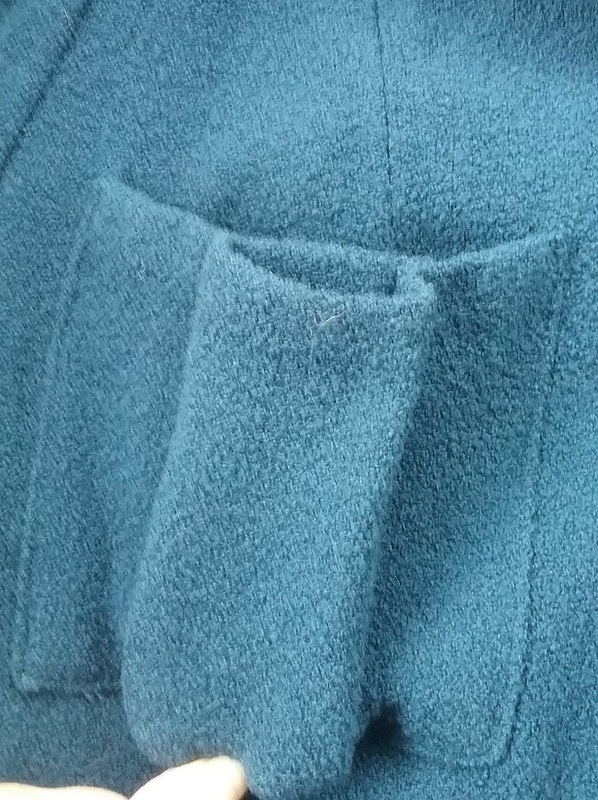 There are four roomy pockets, and this one on the chest has a bit of a pocket within a pocket. Could it be for eyeglasses? 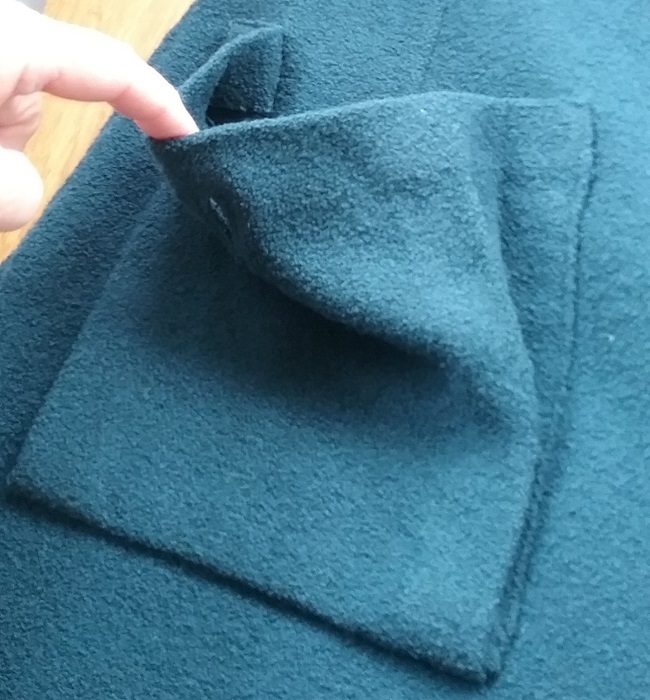 The other pockets expand to hold things and each has a single button closure. 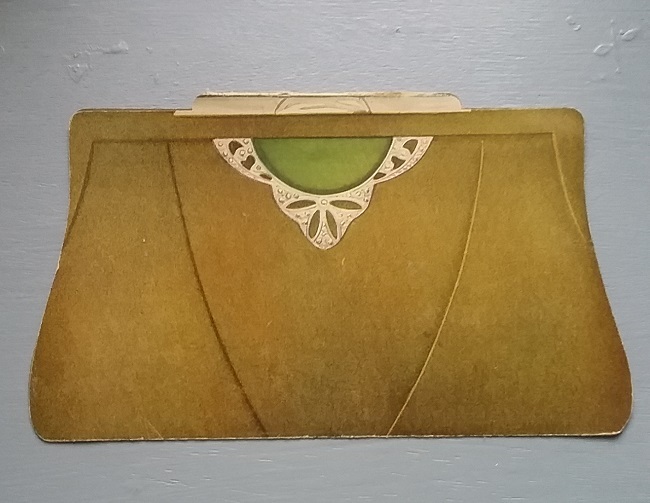 If you were headed to the air raid shelter, these pockets would be very practical, and could hold everything from your identification papers to a snack. But these pockets make no sense on a ski suit, where the patch pockets are not secure enough to keep things safe while hurtling down a mountain. 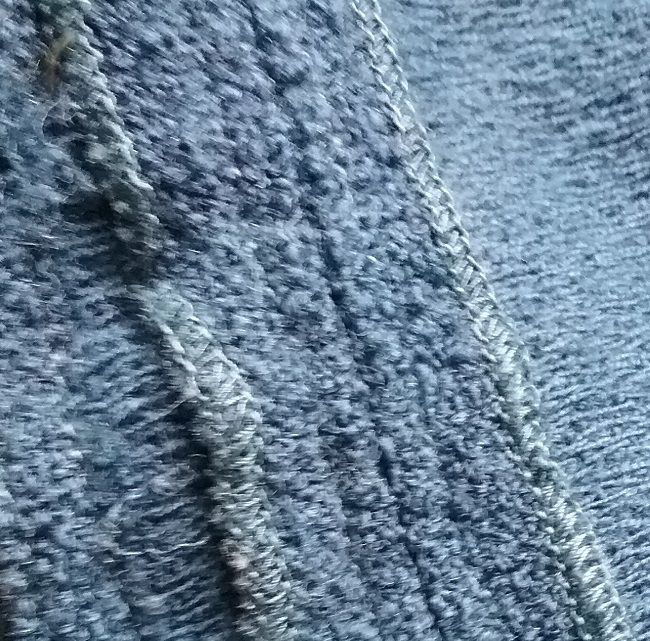 Most ski pants and jackets have deep inset pockets, and these are generally zippered. 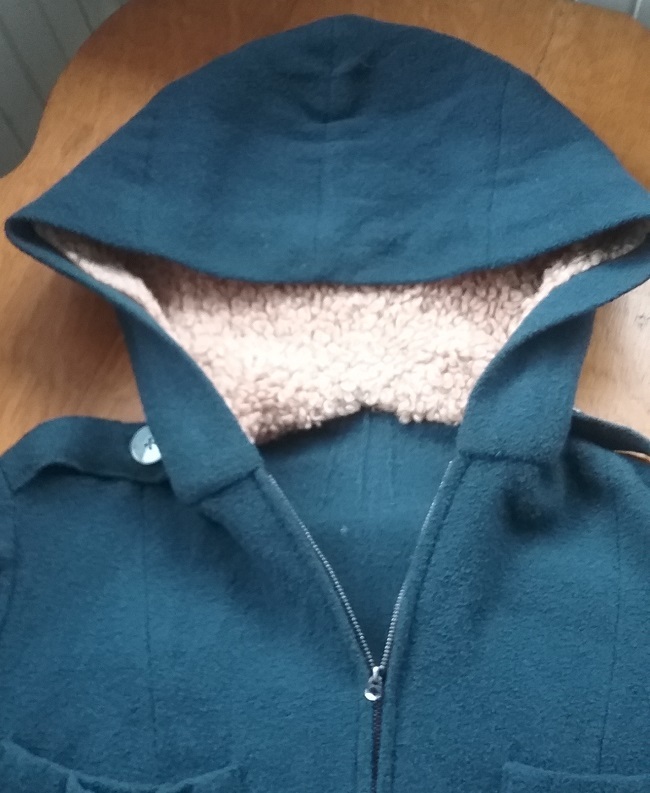 The presence of a hood certainly seems to say “outdoors wear” but this hood is quite loose around the head, and there is no way to secure it. A ski hood or cap would tie or fit snugly on the head. It would be warm, though! In spite of the wrong buttons, the missing belt, and the mis-attribution of the piece, I’m very happy with this purchase. I already have quite a few ski ensembles, but where would I ever find a siren suit? 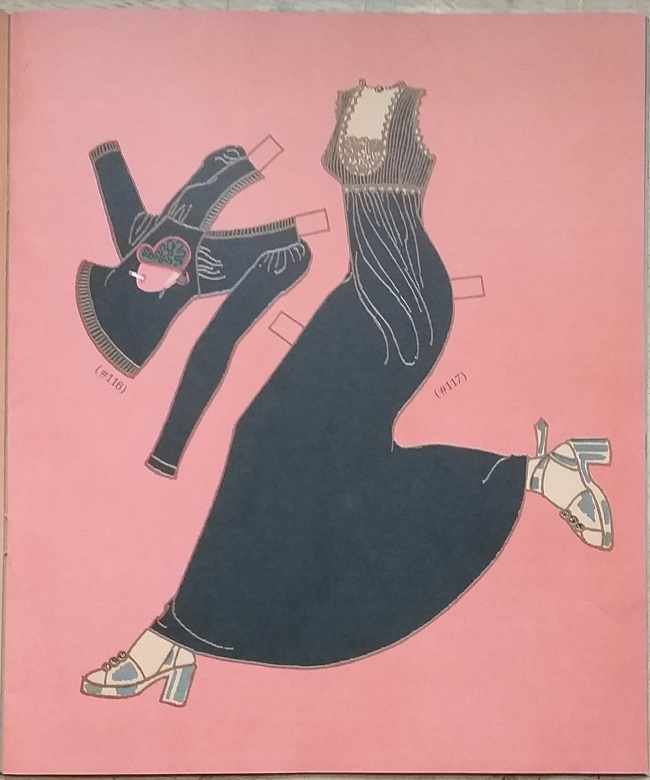 Thanks so much to Jonathan Walford at the Fashion History Museum for the help. Also, the photo of the pattern is not mine, and since I found it on Pinterest, I can’t locate the origin. My apologies to the owner. UPDATE: The pattern belongs to Miss Rayne, and she has graciously agreed to let me use it. We all remember Casual Corner, don’t we? Twenty years ago it was the blandest of all the boring shops at your local shopping mall. 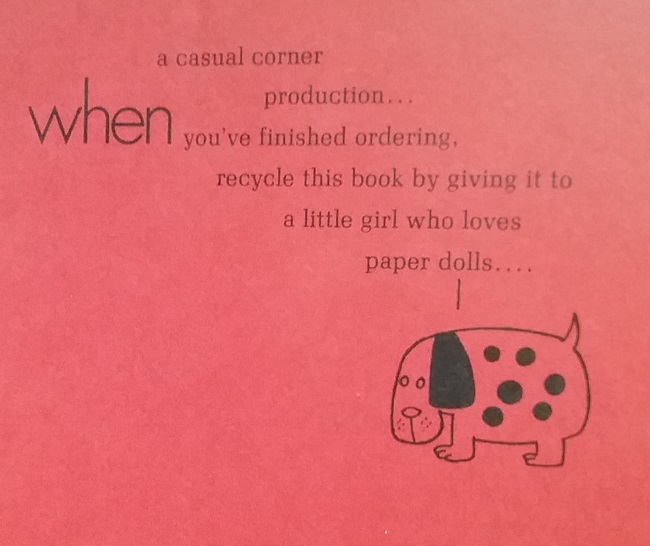 But if you are old enough, you can remember when Casual Corner was young and hip. I can remember very clearly the Casual Corner at McAllister Square Mall in Greenville, South Carolina. When I was a kid we drove down to Greenville occasionally to outlet shop and to visit cousins. By the early 70s we added McAllister Square to the mix. Shopping malls were a new thing, and Asheville didn’t even have one yet, so all your modern shopping happened on trips to Greenville or Atlanta. Casual Corner was first on my list of places to browse. I can recall buying only one item in all the years I loved the store because most of what they carried was over my budget. But once they were having a really great sale, and I bought a printed sheer cotton blouse, with purple and pink romantically entwined flowers. I could have made this myself, but it was a big treat having a blouse from my favorite place of sewing inspiration. I wore it until it fell apart. By the time Casual Corner closed in 2005, it was more of a store for career women. 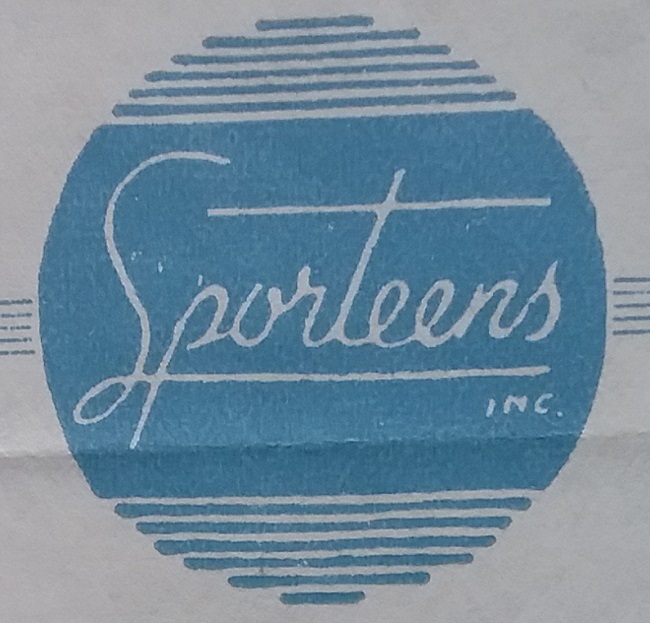 Most of the inventory was their own brand of goods. 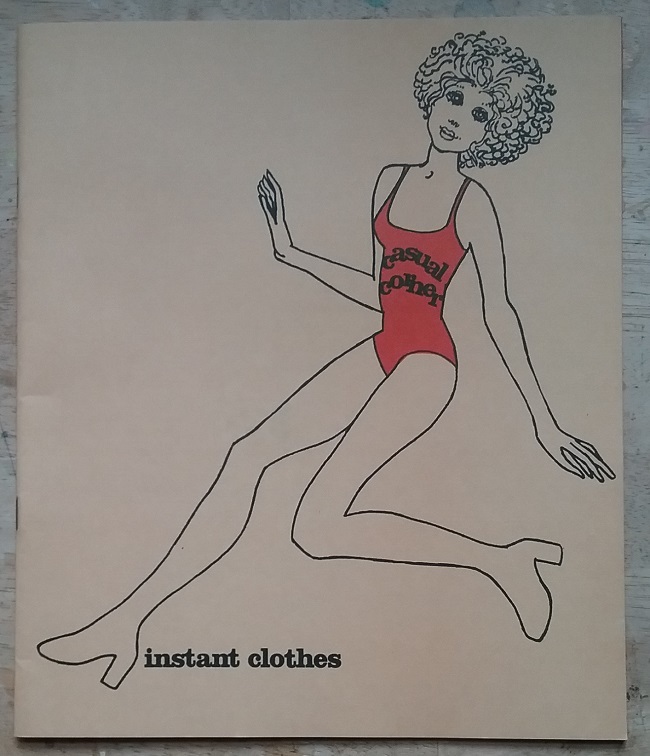 But in the 1970s Casual Corner carried lots of brands that are remembered fondly by girls of the Seventies – Whiting and Davis bags, Organically Grown, Levi Strauss, Sweet Baby Jane, and Happy Legs were just a few of them. 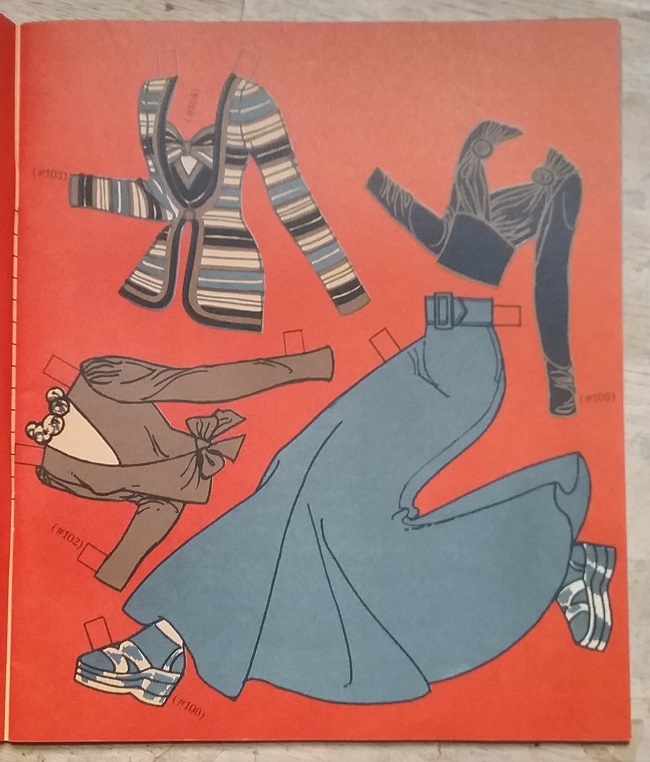 I’m not going to make many comments about each page, as these clothes pretty much sum up what young women and girls wanted to wear in 1973. 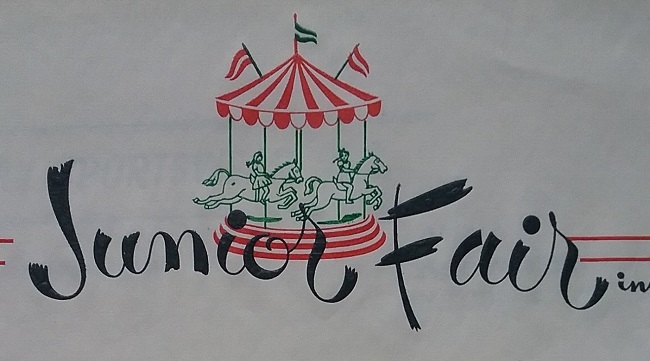 It was all about nostalgia and if you don’t see the 1940s in these designs, then look again. 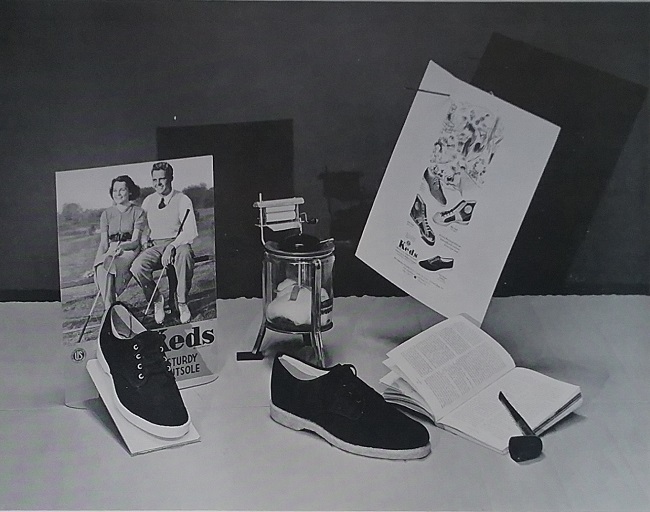 From the platform shoes to the puffed shoulders, 1973 was all about the idea of the 1940s. Were the pants legs really that wide? Well, no, but we thought they were, especially as they swished around the tall platforms, making us look six inches taller. Here’s more 1940s in the form of a turban, mixed with a bit of a 1920s biplane. Wrap sweaters were also very big, and stayed in style for the next few years. 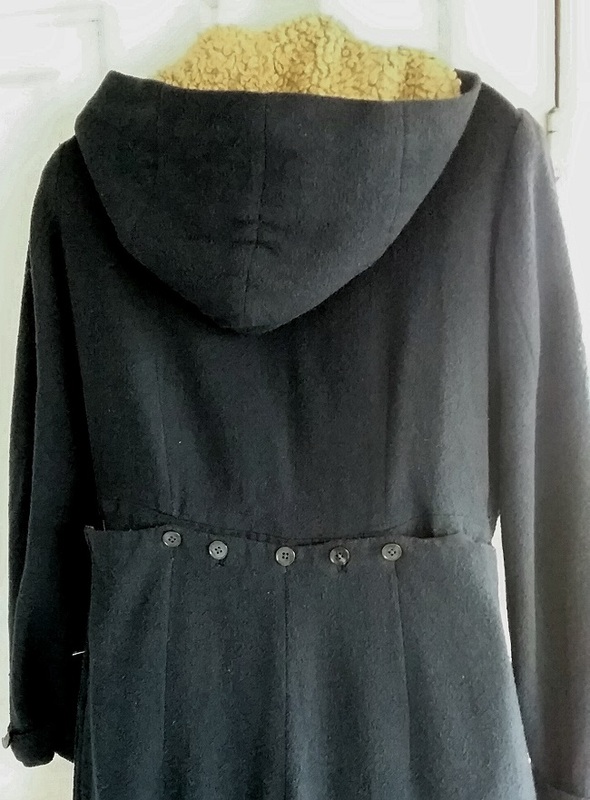 I made my own, having access to great chunky knit fabric in the knitting mills’ outlet stores. 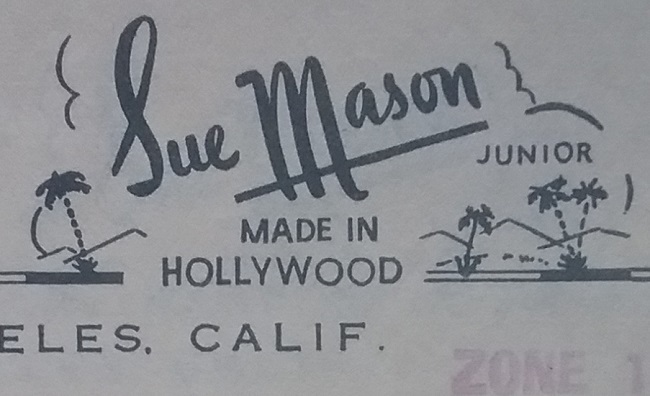 Here’s another reference to smoking, and the Camel logo is also a bit of a 40s throwback. We all thought people who smoked Camels had to be WWII vets. 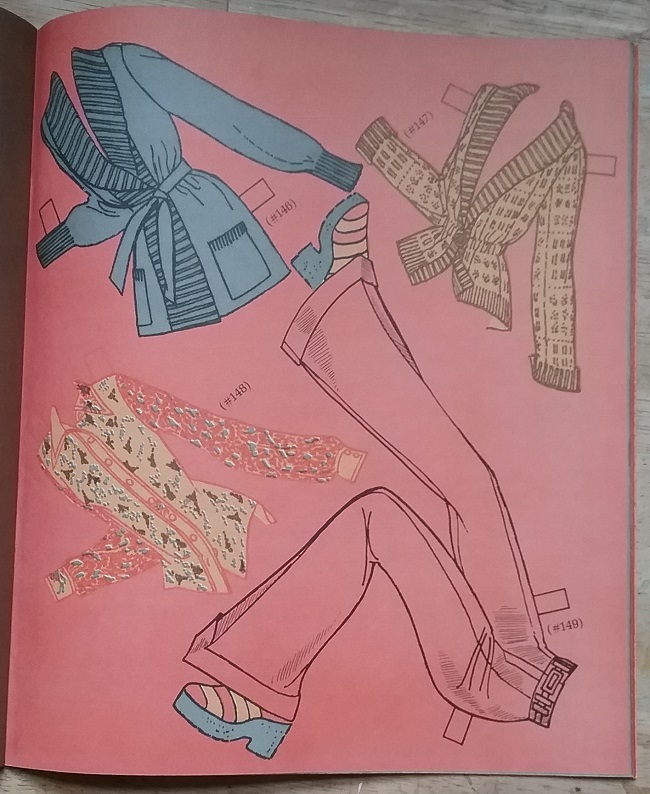 My heart skipped a beat when I read the description of the cardigan at the bottom of the page. It’s the 1970s sweater of my dreams. I really enjoy the tourist sweater too, with scintillating strips and city names (New York, Miami, San Francisco) knitted in lurex. 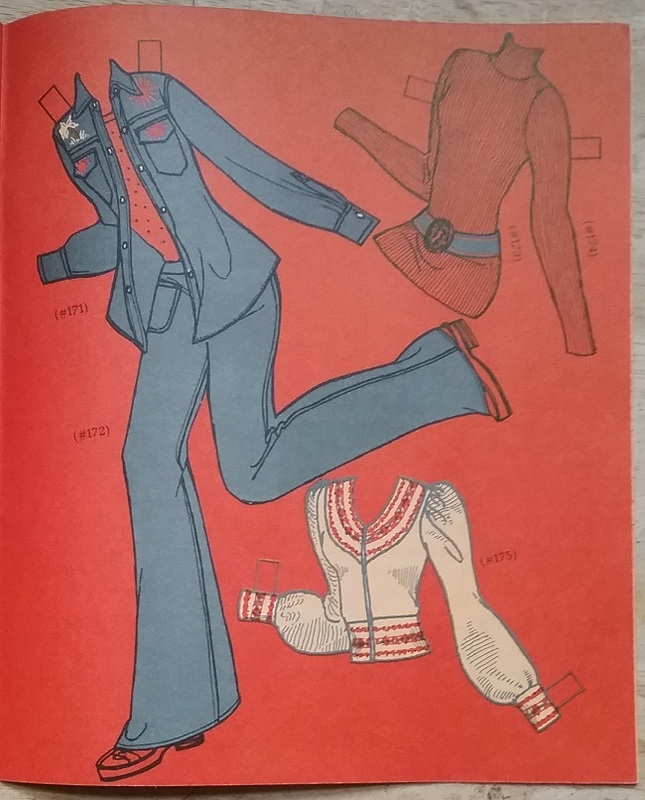 Could that be the start of the leisure suit? And that sweater at bottom? I had similar ones in every color. We loved the Fair Isle look. When I got to this page I knew I had an image to confirm the dating of the catalog. 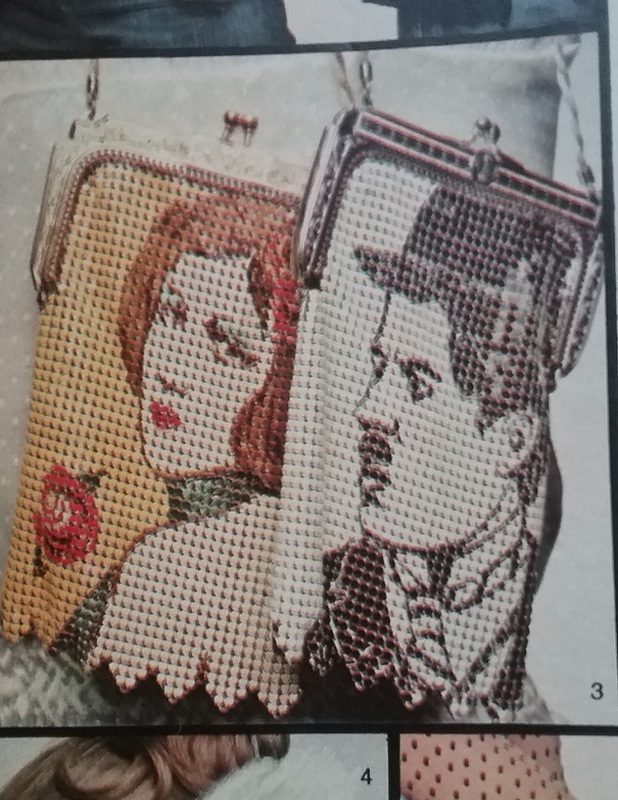 The Charlie Chaplin bag was made by Whiting & Davis, and the story goes that this bag and others that featured silent screen stars had to be pulled from production due to copyright infringement. Because of that, the bags are pretty rare today, plus the fact that they cost $20, which was a lot of money then. 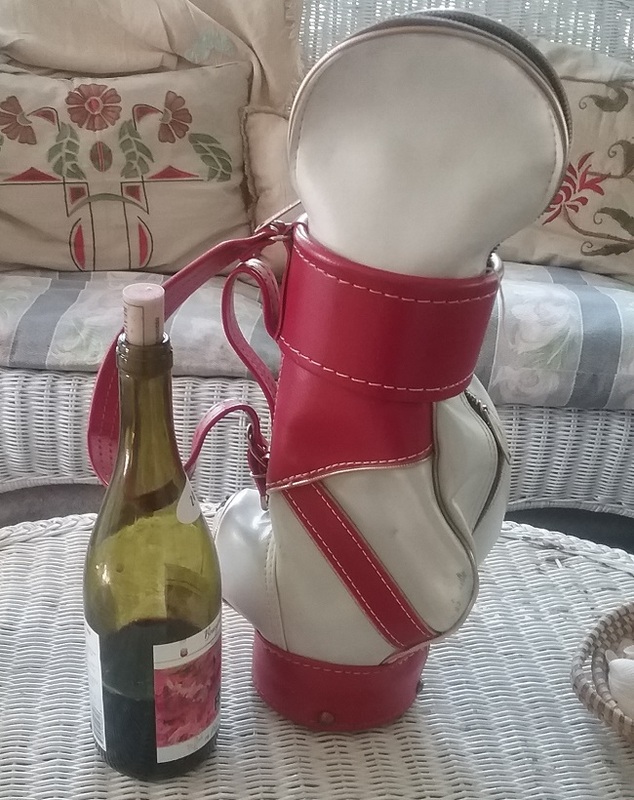 I knew I had an image of this bag in a 1970s Seventeen magazine, but rather than head to the magazine stacks, I took the shortcut of an internet search. What I found was surprising. 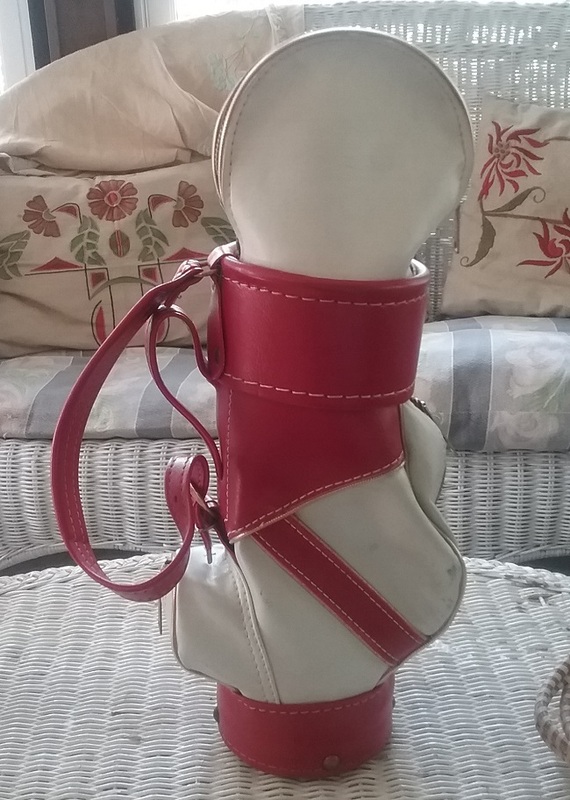 Several websites dated this bag to 1976. The more I looked and read, the more I realized this is a case of information being copied and re-copied from the same original source. All that sent me to the magazines stacks – the place I should have gone to in the first place. I started with 1973, and there was the photo I needed, in the November, 1973 issue of Seventeen. 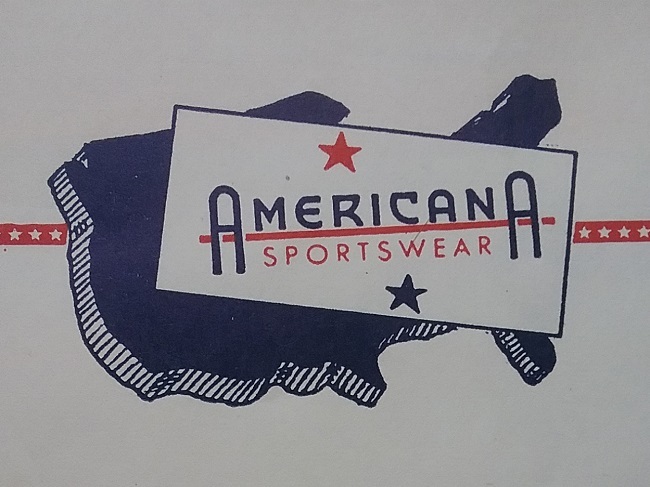 This confirms that my catalog is indeed from 1973. As for the 1976 date, the only way that could be true is if Whiting & Davis re-released the bag that year. I tend to think not, but I’m open to being corrected.